The European Civic Forum launched the European Democratic Citizenship Award in 2014, with the aim to promote citizens’ engagement, and reward outstanding initiatives and civic actors whose day-to-day struggles give real substance to European values, create ownership of the public space and improve the lives of our communities in terms of democracy, social justice and universal access to rights. Comics for Equality project is based on the need to promote the development of a European society based on respect for fundamental human rights, and to fight against racism, xenophobia and other related forms of intolerance. Comics for Equality project aims to foster intercultural dialogue in order to combat racism, xenophobia and discrimination in Europe. In order to achieve this aim, the project seeks to involve migrants and second-generation immigrants – often subjects of discrimination – in the creation of artistic resources – namely comic strips. Youthnet Hellas is a non-governmental organisation based in Greece aims to engage young people at different levels through innovative activities. It aims to promote young people’s active participation, information, social inclusion and active citizenship in community life. The organisation is innovative in the sense that it is “all-online’ and thus environment-friendly, not using any office. In 2014, Youthnet Hellas tried to have an active and immediate role in the society and tried to improve young people lives in practice during the crisis in Greece. Its volunteers therefore used a website and social media pages as platforms to inform young people about all formal and non-formal education opportunities they have in Greece and Europe, as well as internships and work opportunities. The 100 thousand against the Internet tax was a campaign launched to prevent the Hungarian government from implementing a proposed internet-tax. The 100 000 movement organised the biggest opposition demonstration in the past 25 years in Hungary. Orban’s re-elected government had no other choice but to withdraw their proposal. This was the first – and the last time so far for the government that they faced a civil opposition and had to abort completely their plans. The success of the protest sparked further civic protests against the government’s policies throughout the whole Hungarian territory. Marsida Bandili is an academic – currently a PhD Researcher at the University of Antwerp, Belgium – and a youth activist. She was awarded an Erasmus Mundus Scholarship. Her research interests revolve around: Europe2020 Strategy, European Integration and EU Policies, Interest Groups Politics etc. She held the Assistant Professor Position at the University of Tirana, Department of Political Science. 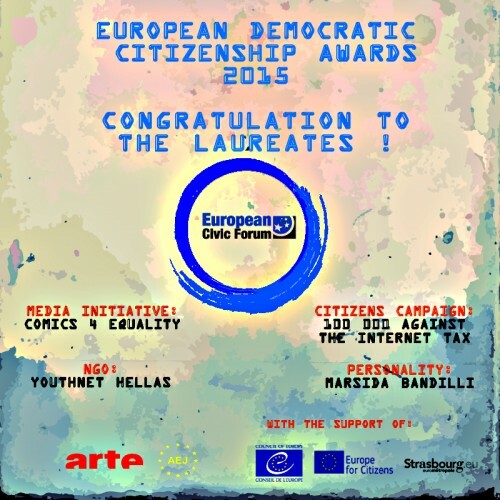 Before being awarded as the Personality of the Year by the European Civic Forum, Marsida already received the Active Citizens of Europe Award in 2014, given by Volonteurope. She is an active, committed member of many networks and organisations all over Europe. Besides these outstanding laureates, the Jury decided to award special mentions to three other initiatives: the Helsinki Committee Hungary, in Loco association in Portugal and VoxEurope media initiative for remarkable contributions to preserve civic and democratic space in Europe. The Awards’ ceremony will take place in the Council of Europe premises in Strasbourg, on 22 October 2015, in the frame of the European Civic Days. You can join us, meet the laureates and engage in dialogue about their extraordinary experiences.